Let's talk about Placentas, one of my very favorite topics. The placenta is an incredible organ designed to sustain our womb-babies life, growing with the baby from the very first cell division. The role of the placenta doesn't stop at birth. As baby is born, the placenta holds on to the mother still, ensuring baby gets all the oxygen, blood and life-force until baby is ready to manage on his own (with Mama's support, of course). In most cultures throughout history the placenta has been honored and revered, and most mammals eat their placenta (placentophagy), including herbivores. The placenta provides mothers with optimal nutrition after birth, yet in our modern-American culture many mothers do not take the placenta up on its nutritional, hormone balancing offer. The benefits of placentophagy, or as I think of it, placenta medicine, are so vast. Benefits have been sited to reduce "baby blues" that occur from the dramatic shift of hormones around 3-5 days after birth, restore vitality & encourage healing for mom, lessen postnatal bleeding by encouraging the uterus to shrink & tone, increase milk supply, restore iron, help with menopausal symptoms, increase libido and much, much more. Seriously who doesn't want to experience this kind of goodness?! It's powerful, holy medicine! These last two benefits I cannot speak of personally because I didn't want to save any of my placenta that long, though I will preserve some for years to come in future births. However, I experienced all the other benefits of eating my placenta, especially its effect on easing the transition from pregnancy to mother hood. My world was rocked by this transition. I felt emotional, primal, protective and weepy. It is completely normal to feel this way after Birth for many reasons, both physical and spiritual. A great physical contributor to the so-called "baby blues" is the incredible shift of hormones in a woman after birth. The mother-baby's placenta is made just for them, unique to one's own needs. By eating the placenta either immediately after birth or in the first few days & weeks postpartum a mom is able to regulate the shift of hormones. I was so grateful to have my own personal Placenta Medicine, and by taking it daily starting on 1.5 days after birth I was able to find a more centered place. The honor that I hold for mine & Sly's placenta is enormous, not just because it sustained Sly in utero, but also for the stability it offered me afterbirth. 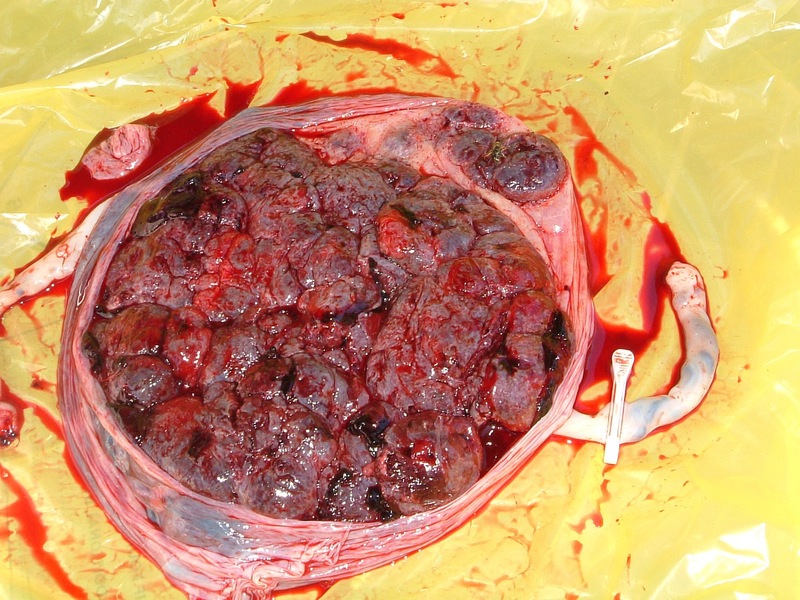 Placenta with sack cut open. Photo from A Midwife's Muse. 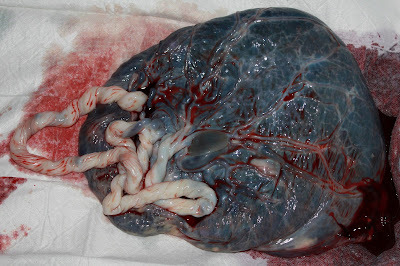 Before birth I knew only 1 other mama that had prepared and ingested her placenta. I am so grateful she told me about it! I read about placenta preparation in Aviva Jill Romm's book Natural Health after Birth, which is now my most recommended book for prenatal mamas. Papa Bear prepared my placenta while I watched and held Sly. It was a simple and deeply reverent experience. I have had the honor of helping a few other women since I began working as a doula with the preparation of their placentas. These women cited similar benefits of helping ease the transition to mother-hood. I feel so blessed to have been a part of their experience through the simple, mindful preparation of their placenta's for them to enjoy the healing benefits. It makes me deeply happy to see families wanting to honor the placenta. Many women who aren't eager to ingest their placenta still find great comfort in honoring their placenta in a sacred way. 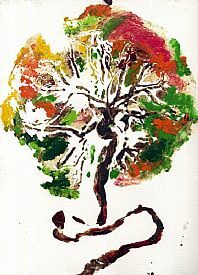 Common tradition are to bury the placenta under a special plant, or make placenta prints with it, a form of art. Cultures around the world engage in a variety of ceremonies to revere the placenta, and I see these ceremonies as alternative Placenta Medicines as well, as they are medicine for the soul. Unfortunately, the largest hospital near me no longer allows placentas to be sent home with patients. Many hospitals still readily send placentas home with patients, and often there is an informed consent for the parents to fill out. After all, the placenta is an organ. Of course, if you birth at home you can do what ever you want with your placenta. I hope to work towards change on this policy through education of the wondrous benefits the placenta has to offer. If you are near my area and interested in my Placenta Encapsulation services, please email me! All placentas are worked with in a healthy, clean environment at either my home or yours. I maintain a clear mind & open heart while working with each placenta, and chant healing mantras through the work as well. on a random note: somehow your webpage was auto populating into my comments on other's blogs. I just noticed it and am not sure how long it has been happening. I don't want you to think I was trying to do something weird if you came across that somewhere.